The Superman Fan Podcast: Episode #388 Part IV: Superman Comic Book Cover Dated October 1965: Action Comics #329! This was definitely a fun issue, with both Super-Cousins facing seemingly overwhelming enemies, and both using their wits to defeat those enemies. I'm especially keen to find out what happens in the next part of the Supergirl story. 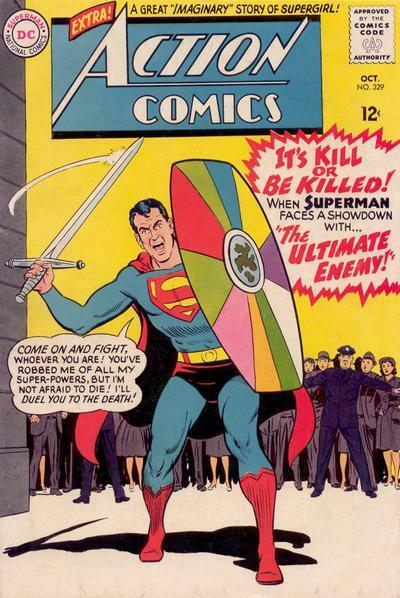 I agree with you that the flag of Krypton is an interesting design, and I think it looks especially cool as a shield. I don't remember ever seeing that Kryptonian sword again, even displayed on the wall of the Fortress of Solitude. You'd think, with all his other souvenirs and memorabilia, he'd include that, too. Maybe he hid it away with other super-weapons, since it is capable of hurting or killing him.